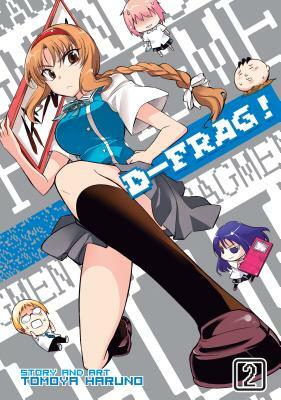 D-Frag! is a new ongoing manga series that parodies high school clubs, nerd culture, and the slice-of-life genre in a side-splittingly hilarious storyline. For fans of manga series about otaku-centric high school clubs like Haganai: I Don't Have Many Friends, Genshiken, or the Melancholy of Haruhi Suzumiya, D-Frag! has the last laugh, as it satirizes the genre like never before. Kazama Kenji thinks he's a delinquent. He's got the look, the style and the attitude to match—he even has a second-rate entourage of sorts. Deep down, however, Kazama is a good-hearted kid who finds himself and his loyal gang in over their heads when they stumble upon the Game Creation Club. The club's formidable members, Chitose, Sakura, Minami, and Roka, are four girls who he might actually be attracted to if they weren't so freaking weird.